From time to time, the BCCS will be recording meetings and presentations. 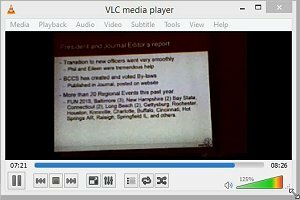 These recordings allow our members who were unable to attend to view the meeting and the educational programs. These recordings are in MP4 format, which should be viewable by any commercial media player. Simply click on the desired link(s) below to view the videos. Some of the file sizes are VERY large, as noted below. Some members may get best results by downloading these recordings to your computer before viewing them. To do this, in your browser, right-click on the link and “Save target as…” (Internet Explorer) or “Save link as…” (Google Chrome), etc. Once downloaded, it should be easy to view these recordings. Here are the recordings of the recent 2018 BCCS Annual Meeting, held at the ANA's World's Fair of Money in Philadelphia, August 15th. The meeting is presented in six (VERY LARGE) video files. You will need to maximize the volume on your media/video player, and both the video and audio quality is fairly good. The files have been broken up into six files based on topic: Introduction and Club business (officer reports), Literary Awards, Future initiatives, and the educational program, Charles Barber's New Image, which is broken into three files. Please note these videos were taken on an iPhone, due to the Union at the PA Convention Center requiring the hiring of unneeded union labor to record the meeting in any other manner. We had arranged for the meeting to be recorded professionally, but had to cancel that due to the Union demands for unnecessary hiring of labor. We apologize for this, but these recordings came out fairly good, given the situation. We will not have this problem next year! Here are the recordings of the recent 2017 BCCS Annual Meeting, held at the ANA's World's Fair of Money in Denver, August 2nd. The meeting is presented in three (VERY LARGE) video files. You will need to maximize the volume on your media/video player, and both the video and audio quality is fairly good. The files have been broken up into three files based on topic (versus strict order of agenda): Club business (officer reports, initiatives, etc. ), Literary and Journal Editor's Awards, and the educational program, Working with Images. Here are the recordings of the recent Regional Meeting at FUN 2017. The meeting is presented in two (VERY LARGE) video files. You will need to maximize the volume on your media/video player. The 2016 BCCS Annual Meeting was held August 10th at the ANA's World's Fair of Money in Anaheim. The 6 video files below each contain a recording of part of the meeting's agenda. The meeting was divided up into these 6 files to allow manageable file sizes (although they are still large). Both video and audio are clear. Enjoy!